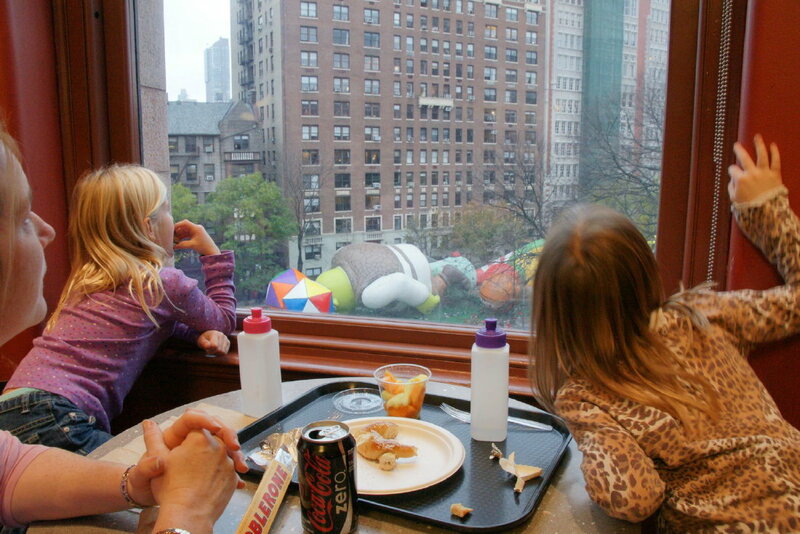 Ever thought about taking the kids to the Thanksgiving Day Parade? We did it last year and had tons of fun. I know it’s a bit intimidating, but Cute W and I firmly believe it’s one of those things everyone should do once, and we figured that we’d get it in while the kids were still young enough to be completely dazzled. If you’ve considered it but wish you had an Action Plan, I’ll tell you what we did. The parade begins at 9 am on Thanksgiving, and we knew that we’d need to arrive early in order to get a spot along the route, so we drove down to the NYC area the day before and planned to spend Wednesday doing something kid-friendly. Now, we’re too cheap to spend the big bucks on a Manhattan hotel, and we wanted it to be just-our-family rather than a visit to friends, so we Pricelined a hotel in Fort Lee, NJ. This is directly across the George Washington Bridge from the Upper West Side of Manhattan. From the hotel, it was easy to drive over the bridge and park along the red subway line. You know that I hate driving, and city driving scares me. But this is relatively easy and low-stress. We parked near Broadway & 116th Street because we used to live there and know the area well. Ummm, duh! 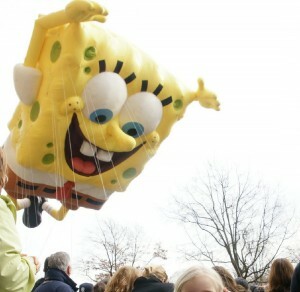 We completely didn’t put it together that this is where they blow up the floats! Amazingly, the place wasn’t mobbed, and we were able to get window seats. We ended up eating close to the hotel and the girls took a little dip in the pool, but it was an early bedtime because we woke up at 5:30 am to head into the city. We parked on the street again and took the subway and then walked over to Central Park West. It was surprisingly crowded already. In retrospect, I’d recommend that you plan to arrive at the parade site by 6 am at the latest to secure a spot. We were bitter because in the past, the wall along the park had been a great place to sit and spectate, but these days the park side of the street is blocked off for bleachers for VIPs. Or not VIPs, exactly, but PWAMITU (People Who Are More Important Than Us). We managed to score a little indentation in front of a dentist’s office. Still, it got a bit squishy. 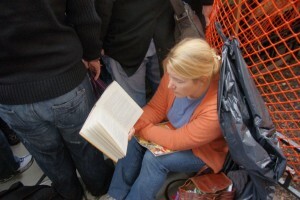 Reading a story, I was both surprisingly cozy and surprisingly close to strangers’ buttocks. Limit the kids’ fluid intake. Bring a blanket, camp chair, or something that will mark your territory and allow you to avoid sitting on cold pavement. Wear clothing layers. You could get cold, but you also don’t want to be bogged down holding too much. Bring snacks, but not snacks that will make the kids too thirsty (see 1). Identify a store or restaurant that has a bathroom before you find your spot, and then walk over to Central Park West staying close to the cross street with a bathroom. Don’t forget your camera, perhaps binoculars if you’d like to recognize specific celebrities. In fact, if I did it again, I might check the website for a last-minute list of celebrities so that I could appreciate it and share the information with my parade neighbors. Try to have more adults than children present. Because they will be spending time on your shoulders. Which can be exhausting. Make sure that the grown-ups have charged cell phones in case you get separated. As you may have guessed, I was stressed out about the whole bathroom issue. We did have to take a bathroom break, and I brought the girls while Cute W maintained our territory. I feared grumbling and hostility, but it was absolutely fine. It’s a family event, you know. Some people muttered that we were crazy to leave, but I just kept smiling and saying “Excuse me” nicely. When we actually worked our way back to our place, we followed our original path as much as possible, so folks knew that we had a spot further in. Some even congratulated us on successfully visiting the bathroom. 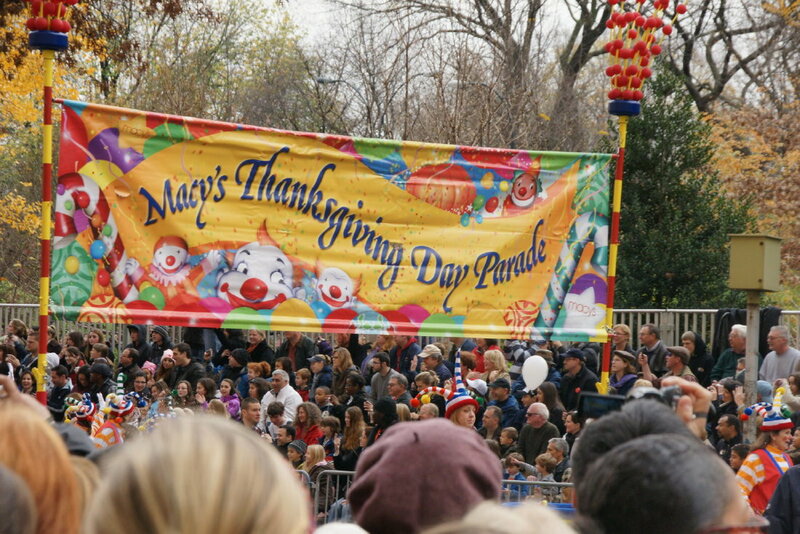 The blond head in the foreground is M.
Of course, when you’re watching from the Upper West Side, the parade itself is finished long before the live tv version, which is filming at 34th Street. See the parade route here for details. We were on our way out by 10 or 10:30 am. The farther downtown you go, the slower the parade will pass by. Since our destination was Thanksgiving dinner in New Jersey at about 3 or 4 pm, the timing was excellent. It’s a hassle, I agree, but it was well worth it. You’re making memories, people! When we lived in NYC (also in the CU area,) we pretty much avoided the Thanksgiving Parade. But, one year when the kids were much younger, we splurged on a midtown hotel where easily accessed the parade AND enjoyed a Thanksgiving dinner buffet. This was one of the most relaxed and pleasant holiday meals ever! Oh, we once did the same thing with the in-laws for New Year’s Eve. . . much better than being one of the huddled masses in that case.